Cloud 9, what a glorious place to be. On that cloud overwhelming feeling of gratitude and joy surround me. I feel like doing cartwheels, dancing, and singing. The smile on my face is unbreakable. Sometimes we have to will ourselves to climb up to that magical place. 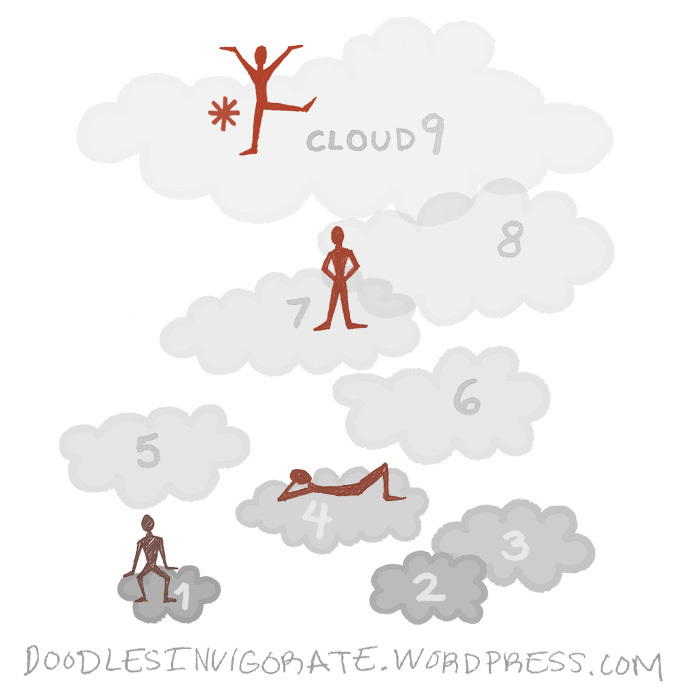 Yesterday, I was moping on cloud 1. Today, I’m skipping on cloud 9. Cloud 9! This made me smile! YES and AMEN. God is good! His LOVE endures forever! Love this! Great picture too! Cloud 9 days are the best! Wanna tell you something, on the moment no words… so it’s will come later on… It was in a dream, someone said: “Your mother is handicapped, crippled, old… before she dies, become a christian, just to please her.” that’s in short… My Mother name (no-joke) Maria … she was working for salvation army, cool isn’t it… too much thought, and disturbance on the moment (cyber cafe)… see you later… by the way, found something about my (body) family… A girl Natasha, grandpa, is the brother of my father… search to be continue! One of my favorite verses! And you are correct, how you feel can definitely be determined by what cloud you are residing on. Love the thought behind your doodle.